Like a few other murtis, this one has diamonds embedded in the eyes and navel, and with His trunk pointing to the left. One speciality of this temple is that the prasad offered to this Ganapati at Pali is Besan Laadu instead of Modak that is normally offered to other Ganapatis. The shape of the idol itself bears a striking remblance with the mountain which forms the backdrop of this temple. This is more prominently felt if one views the photograph of the mountain and then sees the idol. The original wooden temple was reconstructed in to a stone temple by Nana Phadanavis in 1760. There are two small lakes constructed on two sides of the temple. One of them is reserved for the puja (worship) of the Deity. This Temple faces the east and has two sanctums. The inner one houses the murti and has a Mushika (Ganesha’s mouse vahana) with modaka in his forepaws in front of it. The hall, supported by eight exquisitely carved pillars demands as much attention as the idol, sitting on throne carved like a Cyprus tree. The eight pillars depict the eight directions. Inner sanctum is 15 feet tall and outer one is 12 feet tall. The temple is constructed in such a way that after the winter (dakshinayan : southward movement of the sun) solstice, the sun rays fall on the Ganesha murti at sunrise. The temple is built with stones which are stuck together very tight using melted lead. The legendary story of Shri Ballaleshwar is covered in Upasana Khand Section -22 occurred in Pali the old name Pallipur. Kalyansheth was a merchant in Pallipur and was married to Indumati. The couple was childless for quite some time but later was blessed with a son known as Ballal. As Ballal grew, he spent much of his time in worshiping and praying. He was devotee of Lord Ganesha and used to worship stone idol of Shri Ganesha in the forest along with his friends and companions. As it used to take time, the friends would reach home late. Regular delay in returning house used to irritate the parents of the friends of Ballal who complained to his father saying that Ballal was responsible for spoiling the kids. Already unhappy with Ballal for not concentrating on his studies, Kalyansheth was boiling with anger when he heard the complaint. Immediately he reached the place of worship in the forest and devastated Pooja arrangements organized by Ballal and his friends. He threw away the Stone Idol of Shri Ganesh and broke the pandal. All the kids got frightened but Ballal who was engrossed in Pooja and japa, did not even know what was happening around. Kalayan beat Ballal mercilessly and tied him to the tree saying to get fed and freed by Shri Ganesha. He left for home thereafter. Ballal semiconscious and tied to the tree in the forest was lying as that with severe pain all over, started calling his beloved God, Shri Ganesha. “O Lord, Shri Ganesha, I was busy in praying you, I was right and humble but my cruel father has spoiled my act of devotion and hence I am unable to perform Pooja.” Shri Ganesha was pleased and responded quickly. Ballal was freed. He blessed Ballal to be superior devotee with larger lifespan. Shri Ganesha hugged Ballal and said that his father would suffer for his wrongdoings. Ballal insisted that Lord Ganesha should continue to stay there at Pali. Nodding His head Shri Ganesha made his permanent stay at Pali as Ballal Vinayak and disappeared in a large stone. This is famous as Shri Ballaleshwar. In the above mentioned story the stone idol which Ballal used to worship and which was thrown away by Kalyan Sheth is known as Dhundi Vinayak. The idol is facing west. The birth celebration of Dhundi Vinayak takes place from Jeshtha Pratipada to Panchami. From ancient time, it is a practice to take darshan of Dhundi Vinayak before proceeding to main idol Shree Ballaleshwar. Ganesha is said to reside here in the form of Varada Vinayaka, the giver of bounty and success. 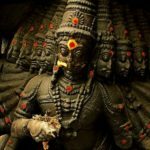 The idol was found in the adjoining lake (to Mr. Dhondu Paudkar in 1690AD), in an immersed position and hence its weathered look. 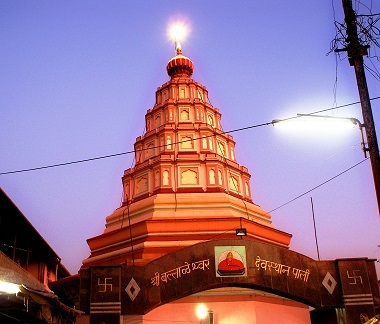 In 1725AD the then Kalyan subhedar, Mr. Ramji Mahadev Biwalkar built the Varadavinayak temple and the village of Mahad. 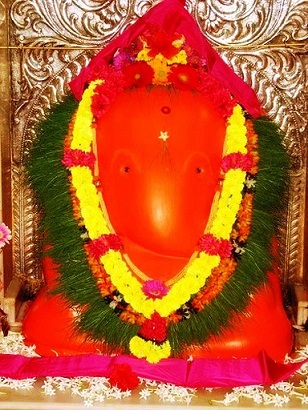 Mahad is a pretty village set in the hilly region of Konkan in the Raigarh district and the Khalapur Taluka of Maharastra.Lord Ganesha as Varad Vinayak fulfills all desires and grants all boons. This region was known as Bhadrak or Madhak in ancient times. The Original Idol of Varad Vinayak can be seen outside the sanctum. Both Idols are located in two corners- the Idol on the left is smeared in vermillion with its trunk turned left, and the idol on the right is made of white marble with its trunk turned to the right . The sanctum is made of stone and is surronded by beautiful stone elephant carving which house the idol. There are 4 elephant idols on 4 sides of the temple. Two stone idols of Riddhi & Siddhi can also be seen in the sanctum. This is the only temple where devotees are allowed to personally pay their homage and respects to the idol. They are allowed in the immediate vicinity of this idol to perform their prayers. Ganesha is believed to have got back the precious Chinatamani jewel from the greedy Guna for sage Kapila at this spot. However, after bringing back the jewel, sage Kapila put it in Vinayaka’s (Ganesha’s) neck. Thus the name Chintamani Vinayak. 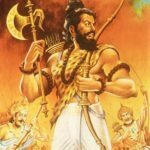 This happened under the Kadamb tree, therefore Theur is known as Kadambanagar in old times. Known to be one of the larger and more famous of the eight revered shrines, the temple is situated in the village of Theur, 25 km from Pune. The hall has a black stone water fountain in it. Beside the central shrine dedicated to Ganesha, there are three smaller shrines in the temple complex dedicated to Shiva, Vishnu-Lakshmi and Hanuman. Lord Ganesha is worshipped by the name ‘Chintamani’ in this temple as it is believed he provides deliverance from worries. The lake behind the temple is called Kadambteertha. The temple entrance is North facing. The outer wooden hall was built by Peshwas. The main temple is supposed to have been built by Dharanidhar Maharaj Dev from the family-lineage of Shri Moraya Gosavi. He must have built this around 100 years before Senior Shrimant Madhavrao Peshwa built the outer wooden hall. Theur’s Chintamani was the family deity of Shrimant Madhavrao I Peshwa. He suffered from tuberculosis and died at a very young age (27years). He is supposed to have died in this temple. His wife, Ramabai committed Sati with him on 18 November 1772.